122 km from Nashik in the Ahmednagar district of Maharashtra is located Shirdi which is the abode of the renowned mystic and saint Sai Baba who has a huge following in India and is revered by millions of people across the world. One of the busiest and richest pilgrim centres in India, Shirdi is famous for the temple dedicated to Sai Baba, visited by thousands of visitors. Devotees queue for hours to have a glimpse and seek the blessings of the life-size marble statue of Sai Baba who has been a beacon of faith and fulfillment to millions of devotees. Sri Sai Baba has been buried here. Hence, a pilgrimage to the vast temple complex dedicated to Sai Baba holds great significance for his followers. 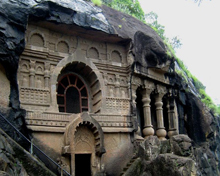 Alandi, Shegaon, Ramkund, Muktidham, Kalaram Temple, Pandavleni Caves, Coin Museum, Tribakeshwar, Bhimashankar,Shanishinganapur, Daulatabad and Ellora Caves are some of the tourist and pilgrimage attractions around Shirdi. Many hotels, resorts have popped up in Shirdi to cater for this pilgrimage destination. There are good numbers of hotels including Sun-N-Sand, Shraddha Park Inn, Hotel Eshosans and Saish Hotel. For a budget traveler, accommodation options are in a plenty. The Aurangabad Airport, 130 kilometres away from Shridi. Is the nearest airport to Shirdi. The airport is well-connected by flight to major cities like Delhi, Mumbai and Hyderabad. You can reach Shirdi from Aurangabad by taxi or bus. If you prefer the mode of Rail, Kopergaon Railway Station, 16 kilometres away, is the nearest railhead to Shirdi. Kopergaon is well-connected to major cities and places of India through rail. From Kopergaon you can board state run buses, private buses, taxis and cabs to reach Shirdi. From Delhi you can board the Goa Express to reach Kopergaon. Goa express departs from Hazrat Nizamuddin railway station in Delhi and terminates at Vasco Railway station in Goa. Maharashtra State Transport buses are available from major cities like Nashik, Mumbai, Aurangabad, Ahmednagar, Pune and Kopargaon to Shirdi. Private air-conditioned buses also ply from various cities of Maharashtra to Shirdi. 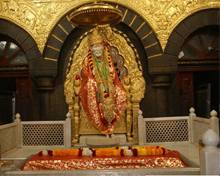 Shirdi is well connected by motorable roads in Maharshtra India to the major cities. Some of the cities of Maharashtra that are well connected with Shirdi by road Mumbai (302 kms), Nashik (119km), Ahmednagar (94km) and Pune (205km).